I have been searching for Italian plums for years. They never have them at my local grocer or fruit stand, but this past weekend I found them at Costco! I was so excited. They are the best plums for baking and jam making and they are delicious just to eat out of hand, as well. I searched for a recipe and found one in the book Preserving by the Pint by Marisa McClellan. Her book is great for making small batches of jams and other preserved foods. 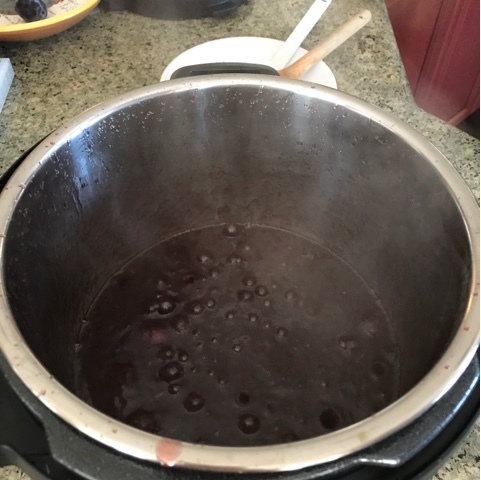 I decided to try making the jam in the Instapot, mainly because my copper jam pan is huge and is not good for making small batches of jam. I doubled Marisa's ingredients from the book, yielding three pints of the most delicious plum jam. I had to try it right away on a slice of sourdough toast. Success! The texture and thickness is perfect and it didn't take much time or effort at all. 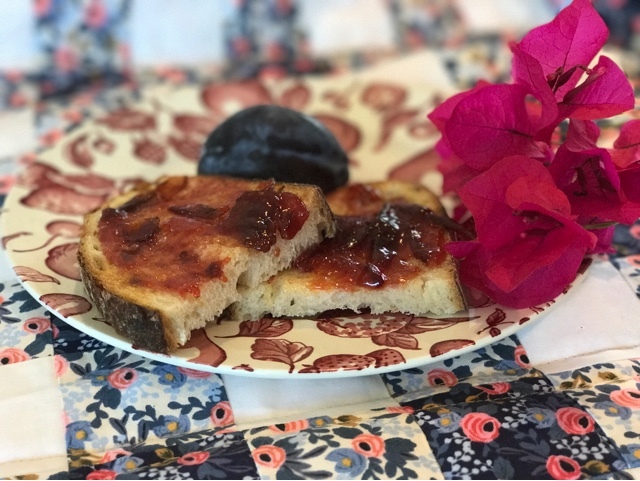 The plum jam turned out so good that I immediately made a small batch of fig jam using Marissa's suggested addition of fresh thyme. Another one for the record books. I love making jam. I headed to Costco today to buy more plums and snagged the last box. 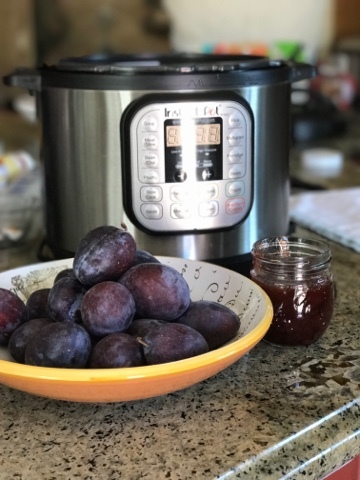 I'm making more plum jam today. Have ready 3 pint jars with lids and rims that have been sterilized in boiling water. Prepare a boiling water bath for processing. 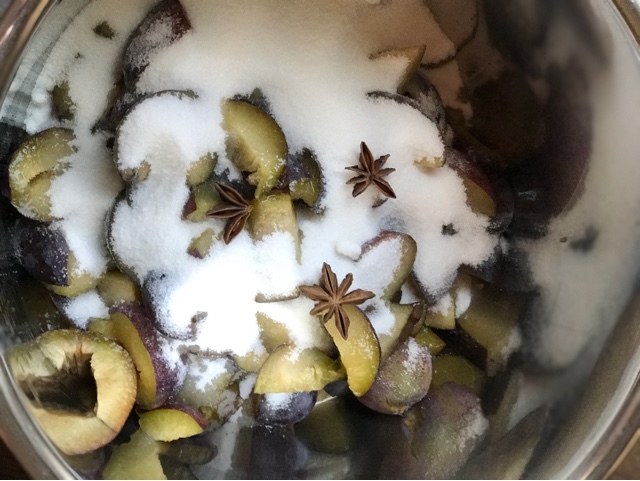 Place chopped plums and sugar in the Instapot. Mix and allow to sit for an hour for the sugar to liquefy a bit. Add the three star anise pieces. Turn the Instapot to the saute setting and bring this mixture up to boiling. When it is boiling, place the lid carefully on the pot and turn off the pot. Immediately set the pot to HIGH pressure and set the timer for 2 minutes. When the 2 minutes is up, turn off pot and allow the pressure to release naturally. When pressure has released, carefully remove the lid and set the pot to saute again. Stir carefully with a wooden spoon or silicone spatula to prevent the jam from scorching and cook until jam is thick; a spatula dragged through the jam should leave a line and the jam should not rush in to fill the space. Pour jam into three sterilized jam jars. Place lids on jars, screw on rims and process in boiling water bath for 10 minutes. Remove the jars carefully, allow to cool and check that lids have sealed. 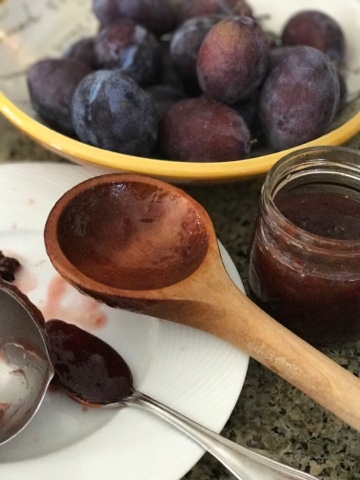 FYI: I attempted to make another batch of the Plum Jam using three pounds of plums and it did not turn out to be as easy as it was with only two pounds. I think there was too much liquid. I do not know enough about the Instapot to know why this happened, but be warned to stick to only using two pounds of fruit.